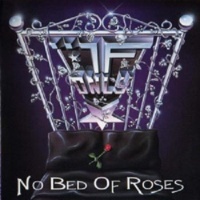 UK band IF ONLY was once hailed by Geoff Downes himself as “No UK band can play AOR that good, they must be from America!”. The band strted out in 1988, centered around vocalist Lorraine Bennington. The rest of the numbers was made up by ex. MORITZ personnel; Greh Hart, guitars/keyboards, Ian Edwards, bass, Andy Stewart, keyboards, and Andy Elphick, drums. They added hot guitarist Martin Chaisson (UFO, WAYSTED). That setting was not to last, and Lorraine was soon replaced by ex GIRLSCHOOL vocalist Jackie Bodimead. After a year and a completed recording process Jackie left, but was soon replaced by Tina Egan. A sturdy re-recording of the vocals later, Tina also added a few songs of her own. When the album was finished and released (in Japan) grunge had made its dreadful impact, delaying the European release a further two years. A return of the band seems highly unlikely, not least due to the fact Tina died back in 1999. But here is a long lost album of…ample qualities? Twelve tracks off the original album, four songs sung by Jackie Bodimead, and one live track with Tina. Opener “Loaded Gun” sure bring back memories of the other giants in the female fronted genre; VIXEN, WITNESS and LEE AARON. It´s like a display of everything positive about the eighties. The refrain is right up there with just about anyone back then. The American AOR balladry of “If Love Could Last Forever”, without being buttery, is also excellent. There is more than a tad of conviction in Tina´s voice as she pronounced the lyrics to “I´m No Angel” with emphasis. The whohooa oa of the title track is another highlight. This is followed by the magic of “Rock and a Hard Place” and the raunchy AOR of “Ghost of You”. Two originals I could have done without are actually the rather short FREDDIE MERCURY tribute “Man Against the World” and the blatant cliché of “Easy Lay”. The Jackie tracks are somewhat weaker in the vocal department. They still rock, with “Stand like a Stone” as a highlight. The live rendition of “Tight Jeans” is also a letdown, why not one of the album tracks? Nevertheless only three tracks out of 17 are not to my liking. The sheer idea of nosing up this old earring is worth the highest mark!